At a wine event recently someone asked “if I order Pinot, what will the server bring me?” It was an interesting question, because when you think “Pinot” the wine that probably comes to mind is Pinot Noir, a very popular red wine. But the fact is, there are many different varieties: Pinot Blanc, the aforementioned Pinot Noir, Pinot Grigio, and the wine I am reviewing today Pinot Gris. The word Pinot comes from the French for “pine cone”, which is just what the bunches look like on the vine: small berries tightly packed together. Pinot Noir = the black pine cone. Pinot Gris = the gray pine cone. Fun fact: Pinot Gris and Pinot Grigio are the same grape, just different names, from France and Italy, respectively. 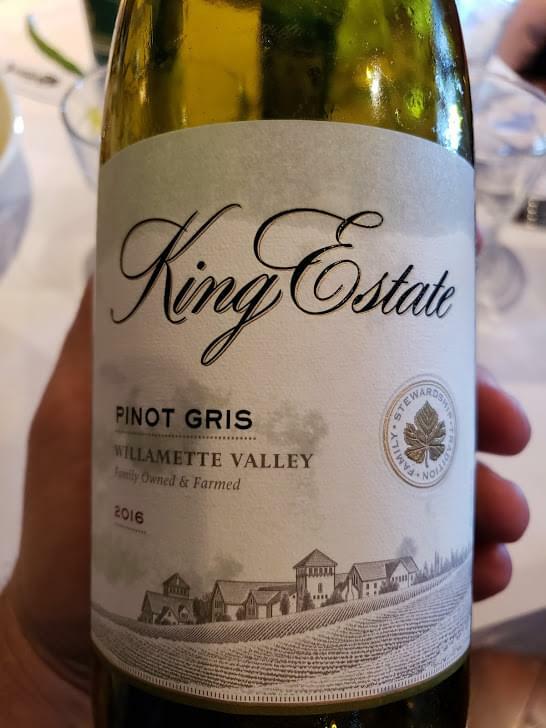 Fun Fact #2: the Pinot Gris I am reviewing today is from Oregon’s King Estate, specifically from the famous Willamette Valley. Pull the cork and you’ll notice light mineral and pink grapefruit aromas, and flavors of lemon and pear, with a lingering finish. This is heavier than a Sauvignon Blanc, lighter than an oaked Chardonnay, with a much deeper flavor than I expected. If you see it on the menu somewhere, it’s definitely worth a look if you’re ordering salmon or spicy Asian food. Take this wine to a summer party, and I guarantee it will be gone by the time you leave. It’s complex enough for a red wine drinker to enjoy, and characteristically light and refreshing, for those who prefer white wine. It was rated 91 points from Wine Enthusiast, and was their Editor’s Choice – this wine’s a winner. On my five-cork scale based on taste and value, the King Estate Pinot Gris gets 3.75 corks! It’s an excellent wine, but at $20 or more per bottle, I think it’s a tad over-priced, so I knocked it down a bit.